Toasted sandwiches are always popular, but to raise the sandwich to the realm of the sublime you need some Panini sandwich filling recipes. 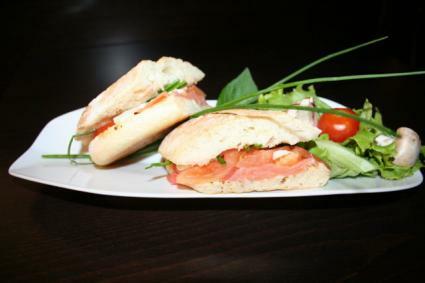 Panini are an Italian style sandwich, which are usually pressed in a device conveniently called a Panini press. Strictly speaking, Panini are not always cooked and when they are cooked, they are not always cooked in a Panini press. The Panini press, while a wonderful tool for making tasty sandwiches, is not always mandatory. I have eaten some fantastic Panini that were pressed with a waffle iron, pressed on a hot grill, and I have made them myself using my cast iron griddle and a 12-inch cast iron pan. So whether you have a Panini press or not, the great taste of this Italian specialty is only a few ingredients away. All you need is a Panini sandwich recipe and some good bread. Panini is the plural of the word Panino, which is Italian for small bread or roll. It is this small bread that gives the Panini its distinctive texture. In order to make an authentic Panini, Foccacia or Chiabatta would be the breads of choice but any thick-crusted hearty bread would work well. You can make your own Foccacia by using the Foccacia recipe I gave for the Pepperoni pizza recipe. Most supermarkets carry a selection of "rustic" breads and, if you're not very familiar with the varieties, this would be an opportune time to try a few to see which breads you like the best. Look for breads that will fit your Panini press when cut crosswise. This is why the sandwiches are made on small rolls or Panini. Salami - Hard salamis work best. Salamis can be very spicy sometimes; if you are not sure which salami you like best, ask your deli man for a sample. Capocolla - Capocolla is an Italian cured ham. It can also be very, very spicy. Try it, Capocolla is very good. Prosciutto - Prosciutto is another Italian ham. This one is dry-cured and is usually sliced very thinly. Mortadella - Is a form of salami that was originally produced in Bologna, Italy. When other countries started to imitate this delicious sausage, they called it bologna. I suggest you give this one a try. Ordinary bologna is a sad disappointment once you try Mortadella. Pepperoni- It is not just for pizza anymore. You can pair these meats with any cheese that you like, but I like to use provolone. Provolone melts nicely and enhances the flavor of any of the meats I listed above. Provolone comes in several varieties of taste ranging from Provolone Piccante, which is rather sharp, to Provolone Dulce, which is very mild. If you like, you can also use grilled or roasted vegetables as your Panini sandwich filling. Recipes can include any or all of the above ingredients. Grilled vegetables are a good way to get some green into your sandwich. You should try to avoid using lettuce and other leafy greens because the heat of the press will usually make them wilt. You can use whatever sandwich spread you like the best, but the old standbys of mayonnaise and mustard are a good place to start. For a tangy change, you can try to mix one part Dijon mustard with two parts of mayonnaise. Slice the bread crosswise so the top and bottom are approximately the same thickness. Turn your Panini press on and set it to medium. Spread a thin layer of the mayonnaise/mustard mixture on both pieces of bread. Place one slice of the cheese on the bottom piece of bread. Layer the slices of meat on top of the cheese. Place the second slice of cheese on top of the meat. Put the top piece of bread on the sandwich. Place the sandwich in the Panini press and press the top down. Once the bread has been toasted and you can see the distinctive lines that the press creates on the bread, remove the sandwich from the press. Cut in two and enjoy. The thinner the meat and cheese are sliced, the faster they will warm in the press. You can add sprouts if you like to add a pleasant crunch to your Panini. I have found that Peroni beer goes best with a Panini.